As an island nation, Australia is defined by its relationship with the ocean. 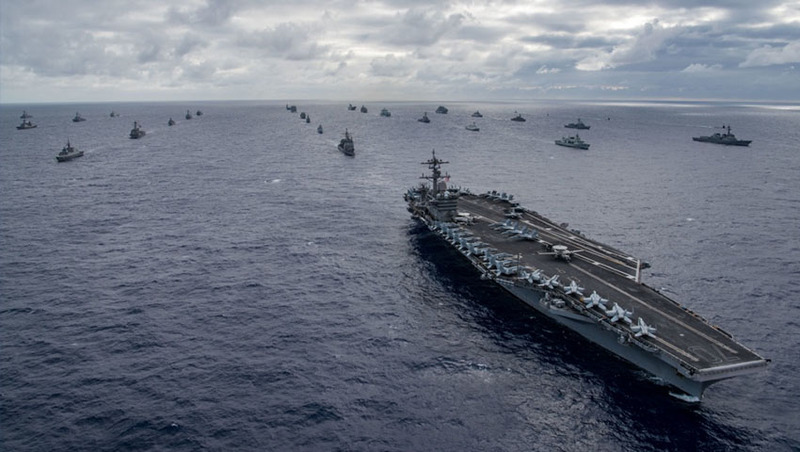 Maritime power projection and sea control play a pivotal role in securing Australia’s economic and strategic security as a result of the intrinsic connection between the nation and Indo-Pacific Asia’s strategic sea-lines-of-communication in the 21st century. Throughout the nation's history, Australia has dependent upon major sea-faring nations to provide maritime security beyond its immediate reach and influence. From Australia's earliest days, the British empire and the mighty Royal Navy ruled the waves, well into the 20th century, providing Australian maritime commerce with the security to take on the world. The rise of the US and the introduction of power projection platforms like aircraft carriers, while eclipsing platforms like the battleship, served to establish an unrivalled global economic, political and strategic order – one Australian, and indeed global, prosperity became increasingly dependent upon. Today, strategic sea-lines-of-communication support over 90 per cent of global trade, a result of the cost effective and reliable nature of sea transport. Indo-Pacific Asia is at the epicentre of the global maritime trade, with about US$5 trillion worth of trade flowing through the South China Sea (SCS) and the strategic waterways and choke points of south-east Asia annually. Meanwhile, the Indian Ocean and its critical global sea-lines-of-communication, are responsible for more than 80 per cent of the world's seaborne trade in critical energy supplies, namely oil and natural gas, which serve as the lifeblood of any advanced economy. Australia is not immune to these geo-political and strategic factors and, as an island nation heavily dependent on sea transport – with 99 per cent of the nation's exports, a substantial amount of its strategic imports, namely liquid fuel, and a substantial proportion of the nation's domestic freight depending on the ocean – it is a necessity to understand and adapt and introduce a focus on maritime power projection and sea control. Recognising the strategic and economic importance of maritime power projection and sea control, Australia has initiated the largest peace time build up of its naval and broader military capability since the Second World War. The Royal Australian Navy will welcome a range of new surface warships ranging from guided missile frigates to offshore patrol vessels and attack submarines as the government recognises the nation's vulnerability. The unique geographic realities of Indo-Pacific Asia ranges from vast swathes of deep, open ocean to Australia's west, to relatively shallow, congested and narrow archipelagic bound choke points, including the Straits of Malacca, Lombok Strait and into the South China Sea. These serve as unique tactical and strategic challenges for all regional nations, including Australia. Further complicating the calculus is the advent of advanced and integrated anti-access/area denial (A2/AD) systems, introduced largely by the Chinese on reclaimed islands in international waters in the the SCS. While sea control has traditionally been the domain of ocean going, 'blue water' navies, the strategic realities combined with the modernisation programs expanding regional naval capabilities requires a hybrid approach, combining traditional 'blue water' and 'green water' capabilities and doctrines. Australia has, since the end of the Forward Defence policy in the early-1970s, been classed as a 'green water' navy, capable of defending its economic exclusive zone (up to 200 nautical miles from shore) in the key confines of the 'sea/air gap" as identified in the 1986 Dibb report. However, the acquisition of new platforms, namely the Canberra Class LHDs, Hobart Class destroyers and the future Hunter and Attack Class vessels, appear to have signalled a step-change in both doctrine and capability ambitions for the Royal Australian Navy as it fits within the broader 'joint force' concept. While the US Navy dominates the world's oceans with its fleet of nuclear powered super carriers, the smaller, amphibious-warfare orientated Expeditionary Strike Groups (ESG) serve as an invaluable naval power projection and sea control model. Additionally, the Cold War-era Surface Action Group (SAG) and World War One and Two U-boat wolf packs serve as potent force structure concepts for enhancing Australian maritime power projection and sea control. A power projection focused RAN? Introduced in the early-1990s, the US Navy's ESG concept provides both the Navy and US Marines with a self-sustaining, highly mobile force capable of responding to a range of contingencies around the globe. Centred on the amphibious, air warfare and sea control capabilities of a large-deck amphibious warfare ship (LHD), the ESG incorporates additional supporting landing platform dock (LPD) ships, a range of surface combatants (including destroyers and frigates), combined with submarine combatants into a bespoke capability package capable of supporting the Army's 2nd Battalion Royal Australian Regiment (2RAR). Additionally, the US Navy model also incorporates a range of aerial components including fixed-wing naval aviation platforms, namely the F-35B Joint Strike Fighters, anti-submarine warfare and medium-to-heavy lift helicopters to support power projection, fleet air defence, close air support and sea control operations in high-intensity environments. The Cold War-era SAG provides a unique force structure concept, combining major surface combatants, namely cruisers, destroyers and frigates to provide additional naval gunfire support for deployed forces ashore, fleet area air and missile defence in the case of guided missile cruisers and destroyers, and advanced anti-submarine warfare capabilities to support larger fleet units like aircraft carriers and afloat support ships or convoys. Meanwhile, the infamous wolf packs of the German Navy serve as an invaluable force structure concept when used in unison with a range of broader defence assets across the 'joint force'. The tactical and strategic force multiplying capabilities of submarines operating as hunter-killer packs in close proximity to key sea-lines-of-communication and geographic choke points are potent sea control and deterrence assets. Each of these force structure concepts is designed to operate at both the tactical and strategic level as a combined force, independently or as part of coalition operations, while being capable of leveraging advantages provided by technology, interoperability, personnel and broader doctrine to serve as part of a 'joint force' with the Army and Royal Australian Air Force to provide a long-range, power projection force. These force structure concepts serve not only as powerful symbols of Australia's sovereignty and evolving responsibilities and role in supporting and enhancing the security and prosperity of Indo-Pacific Asia, they also serve as powerful 'hard power' examples of Australian diplomacy, furthering the nation's national interests and security agenda through a robust, self-sustaining and forward deployed maritime presence.